If you try to create a new file in a repository that you don’t have access to, we will fork the project to your user account and help you send a pull request to the original repository after you commit your change. File names created via the web interface can only contain alphanumeric characters and hyphens (-). To use other characters, create and commit the files locally, then push them to the repository on GitHub Enterprise. For more information, see "Removing sensitive data from a repository." 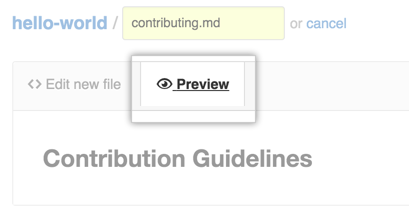 In your repository, browse to the folder where you want to create a file. In the file name field, type the name and extension for the file. To create subdirectories, type the / directory separator. On the Edit new file tab, add content to the file. To review the new content, click Preview. "Initializing an empty repository with a README"